The 2017 Mazda sedan, hatchback and sport car lineup lineup in Trussville, AL includes the 2017 Mazda3 4-Door, the 2017 Mazda3 5-Door, the 2017 Mazda6 and the 2017 Mazda MX-5 Miata. These vehicles are built with stunning performance and versatility to make your everyday life easier. Equipped with high-tech amenities, advanced performance features, and innovative design elements, you’ll find all you need out of your next vehicle in this lineup. The variety of body styles, from sedan to hatchback, and then on to sport car, lets you choose the right performance and dimensions for your needs. Sedans and hatchbacks can be great family vehicles as well as personal vehicles. The sport car is a shape that exudes confidence. All models in the Mazda sedan, hatchback and sport car lineup feature stunning design and forward-thinking features. These cars redefine what luxury can be. No longer is it a brand name, but the decided styling of the vehicle in question. All Mazda vehicles feature soft touch materials, meticulously crafted interiors and refined performance technology. 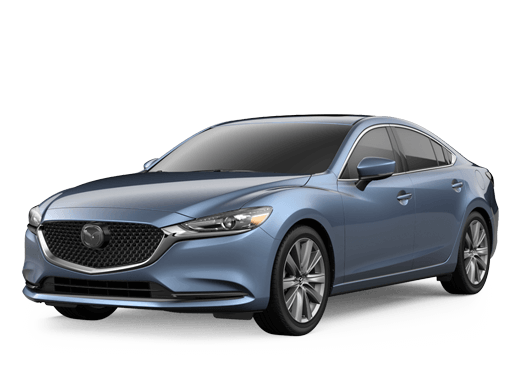 You can view the key features of each model below and see what Mazda has to offer you in your next sedan, hatchback or sport car. This midsize sedan from Mazda. It is built with stunning design and advanced performance. Engineered to be agile and light, this piece of machinery is highly efficient as well as stylish. It comes equipped with a 2.0L SKYACTIV®-G 4-cylinder engine or a 2.5L SKYACTIV®-G 4-cylinder engine. Offered in three trim levels, the Sport, the Touring and the Grand Touring, this model has a trim for every driver. The cousin to the 2017 Mazda3 4-Door, this vehicle modifies the body structure of the traditional sedan and adds a hatchback to the rear end of the vehicle. This improves the cargo capacity and versatility of the vehicle and adds a sporty touch to the exterior appearance. This vehicle gives you the choice between four trim levels: the Sport, the Touring, the Touring 2.5 and the Grand Touring. The Mazda6 is the full-size sedan model from Mazda. This vehicle is stunning, sleek and built with advanced technology for you to enjoy. Spacious seating and refined surfaces are what you’ll find in the 2017 Mazda6. This vehicle comes with a 2.5L SKYACTIV®-G 4-cylinder engine and is capable of seating up to five passengers. Built with innovative design, the Mazda6 is the sedan you’ve been waiting for. Now on to the sports car. Offered in both a soft top and a hardtop version, the 2017 Mazda MX-5 Miata is the quintessential sports car. Agile, light, and daringly fast, the MX-5 is sure to excite. The soft top version offers a Sport trim, a Club trim and a Grand Touring trim. In the hard top, you’ll choose between a Club trim and a Grand Touring trim. All trims are equipped with advanced technology and convenience features so you can motor forward in style.